When God calls a person to do a job, He is very sure of Himself and knows who He wants and why. There are people in history whose lives leave me smiling because there’s no doubt in my mind that God was right smack dab in the middle of their circumstances – working! Did you know that Moses didn’t want to be a leader? He argued with God about it – no, no don’t pick me! I can’t be a leader ‘cuz see, I have this stuttering problem and it’s really going to slow Your plan down. Well… we see here what God had to say about that! It didn’t do Moses much good to argue with God. Helen Adams Keller was born in 1880. She was an American author, political activist, and lecturer. Oh, did I fail to mention that she was the first deaf-blind person to earn a bachelor of arts degree? Her life story has been the subject of at least two very popular movies that I know of – both starring Patty Duke, if I remember right. Helen’s life seemed hopeless at first, didn’t it? If a person ever offered hope and inspiration to the world… it was Helen Keller! Cornelia ten Boom (Corrie) was born in 1892. She was a Dutch watchmaker and Christian who, along with her father and other family members, helped many Jews escape the Nazi Holocaust during World War II. She and her sister and father were imprisoned in a concentration camp for their actions. Corrie’s sister, Elisabeth ten Boom (Betsie) was born in 1885. While incarcerated in Ravensbruck concentration camp, she died at age 59. Corrie and Betsie’s father, Casper ten Boom died just 10 days after being imprisoned. Corrie ten Boom’s famous book, The Hiding Place, describes the ordeal. My dad bought the book for me, and in 1976 he took me to see the movie. Did God use Corrie and her family? I believe He definitely did – and that story still serves to inspire people all over the world. My dad said at the very least, it reminds us of what we never want to see again in the world. It also reminds us that no matter what the world says to do… as Christians we are obligated to obey our God and do the right thing to honor Him. John the Baptist had a definite purpose on this earth… it was to proclaim that the time to repent of sin and turn to God, through His Son, Christ Jesus – is NOW! Guess what? Every follower of Christ has the same purpose. We are here to share the gospel – the good news – of Jesus Christ. It’s our reason for living and our purpose on this planet. I have a unique way of learning Scripture and enriching my relationship with the Lord. I grew up in a generation that was smitten with theatre – but I had a great interest in religious themed theatre… namely, “Godspell” and “Jesus Christ Superstar”. Every time one of those shows was playing, I did my best to get tickets and take a group of friends to see it. I love the music in both plays. I still listen to those soundtracks in the car – and sing with them at the top of my lungs! It makes God smile – and sometimes He laughs too. What can I say? You either watch this and wonder what kind of crazy person is writing this blog… or, like me – you see a sea of symbolism in every frame. I cried as I watched it – because I saw people ditching their STUFF and running to the fountain. They knew that whatever they were hanging on to would not be needed – because Christ is all they need. One woman kicked off her shoes – I love it! Did you see the guy standing on the banks – on the sideline – not getting in the water? He’s the doubter – he’s the one who is almost persuaded. He’s the one we’re ministering to most of all. We love to sharpen the iron of brothers and sisters – and it’s a lot of fun to do that – but we really want to encourage the ones standing at the side – watching – dry – still hanging on to their stuff, because in the world stuff is very important. In the world it’s frowned upon to jump into fountains. Isn’t the world boring? There are different meanings behind the word CHARACTER. We talk about a character that is portrayed in a movie or program on TV. Sometimes we refer to a person as a real CHARACTER… it’s usually not a compliment. It’s rare these days to hear that a person has a good CHARACTER, meaning that they can be trusted and live an upstanding life. Which one of these definitions describe you now? No, wait – don’t tell me. The real question is, which one of these definitions would you like to describe you in 2016? There is just one kind of CHARACTER to be known as – that is to have a good CHARACTER – a good reputation, a good track record, as it were… He is pleased when we are what we’re supposed to be as His child. Sadly, there are a ton of examples of Christians who put forth all the right stuff – or so it seemed – and in the end, they were not genuine in their relationship with Christ. If we are going to claim Christ is our Savior, we need to tow the line in the relationship. I’m not fussing at you, I’m talking to me too. I was sitting in the waiting room at my doctor’s office the other day. A million thoughts ran through my mind because it was so quiet except for the sound of a bubbling fish aquarium. I don’t have a cell phone and I won’t touch a magazine in a waiting room because I don’t want to pick up germs. Think of it logically… who goes to the doctor? People who are sick go to the doctor. If they read the magazines in the waiting room and leave germs on them. It’s cold and flu season… ’tis the season… fa la la… need I say more? So I watched the fish swimming around with not a care in the world. I observed a mother with her small child, an elderly man struggling to walk with a cane, a young woman with her nose stuck in a book she brought with her and a teen scrolling through his phone. I see that a lot in waiting rooms – tweens and teens with their phones. There were no pleasantries exchanged among us. Have you ever felt lonely in public? It’s a strange sensation that makes you feel as though you’re almost invisible. You know you’re physically in the room, but when you receive no smiles, no nods, no acknowledgement whatsoever, it’s as though you don’t exist. Everyone is so busy with their own task at hand – interacting with a child, moving from point A to point B with a cane, reading or texting on a phone. Have you ever wondered if you’ve exceeded your SELL BY date??? I mean, really – when we’re children we have such promise and we’re blessed with great eyesight and quick, rhythmic fingers and we set the world on fire. Suddenly, we are two beats behind and wondering what the heck happened!!! Is there a place for me in life? Would anyone notice if I was not here? Do I have anything to contribute to society that makes a difference to anyone? These are not questions of self-pity or self-loathing, but questions from a heart that desires a sense of purpose. A certain job I’m meant to do which no one else can fulfill. The time will be demanding, and the pay is not too good. And yet I wouldn’t change it for a moment – even if I could! A dream that I must follow because I won’t be back again. There is a mark that I must leave, however small it seems to be. A legacy of love for those who follow after me. A little path that bears my name, awaiting me somewhere. There is a hand that I must hold, a word that I must say. A smile that I must give for there are tears to blow away. There is a special place in life that I was meant to fill. A sunny spot where flowers grow upon a windy hill. And somewhere in this world, I know there is a place for me. It seems the older I get, the less useful I become. Some of it is by choice, I admit. 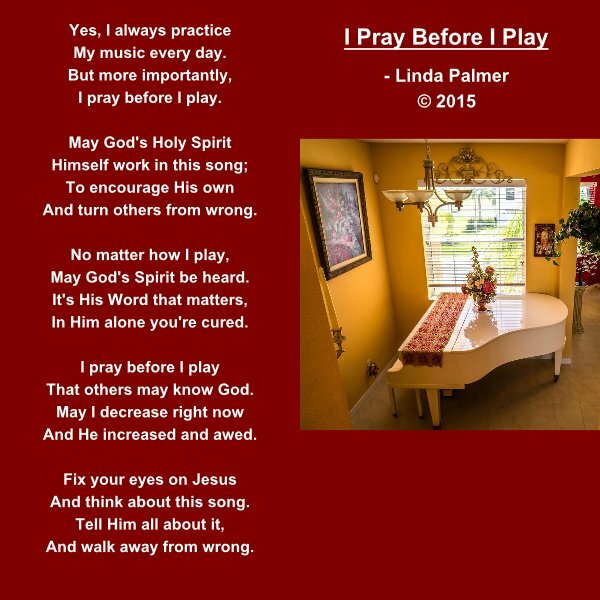 I keep remembering when I was twelve years old – how everyone encouraged me to play the piano in church. The church encourages the youth to serve and make the older people feel unnecessary in service. I don’t understand. Do we not need to feel useful as we age? Do we not need to be encouraged to be a part and serve? I keep hearing that there is not a retirement age in church service. Talk is cheap. It sounds like lip service. Young people are encouraged and old people are forgotten… left sitting at the sidelines as though they are no longer useful. My fingers are arthritic and my eyes can’t tell a natural sign from a sharp anymore, but it’s my prayer that God will find something for me to do for Him. For now He seems to want me to write. I will do what I’m able to do. I will continue to write until He tells me to stop. Of course, I can pray – I will always pray. If I can’t be on the front lines anymore, I can sit on the sidelines and watch… and pray! I served in churches of different denominations for 50 years. I was asked to be church pianist in my home church when I was just 12 years old. In all that time there is one unchanging truth: No matter how well you play or how impressed people are with your ability – it means nothing if your heart is not right and your motives are not pure toward God. You can practice until the cows come home and have every note, every rhythm perfected – but it is only noise to God’s ears if you are performing for people instead of glorifying God. If you make your ministry too much about yourself and not enough about God, it will not only be a huge waste of your time, but God will humble you. He will not be mocked and He will knock you down a few notches. There will always be someone with more talent or who is just a better musician waiting in the wings. If your heart is right with God, that’s not going to bug you or threaten your ministry. A musician in God’s army, regardless of ability, should be on the same team. We’re all working for the same Master – aren’t we? Once a sense of competition or one-upmanship begins, that’s when you need to have some alone time with God and get it straightened out. Serving God should never be like the secular music world. This is not a “battle of the bands”! We’re not just here to entertain the saints. We’re here to minister to souls who may not have accepted Christ as Lord and Savior. Keep your heart right as you minister. If you do, your music will be a sweet sound and the Holy Spirit can use it to speak to lost souls – and to saved souls who may need to be encouraged. I pray He never hears noise when He listens to me play. This day was created in 2010 and it now falls on the first Sunday of May. The movement is meant to honor the memory of children called to heaven. It’s also a support of sorts for grieving mothers. It’s one thing to have tragedy strike and lose a child, but it’s another to feel alone in your grief. Parental grief is intense, long-lasting, and complex. The grief and the healing process contain similar elements for all bereaved parents. Finding others in similar situations will help you move forward, but don’t let anyone rush you through the healing process. You’re not alone. If you think you are, click on the You Tube video, the Carly Marie Project Heal website, the facebook event page or the blog on BlogSpot.com. I invite you to connect with any of these folks because the worst thing you can do is grieve alone. Grieving with others online is really unique in that you can say as much as you want to – and back away and be alone when you need to be alone. The support is there for you when you need it. I believe there is a special place in God’s heart reserved for those who have dealt with the loss of a child, or childlessness for any reason. If I had a nickel for every time I’ve heard someone say that it’s not natural for a parent to outlive their child, well – let’s just say I’d be wealthy. Although we know in our minds that Mother’s Day is the day to show honor and respect for our own mother, I know it’s still a very difficult time for the childless. Some years I can’t go to church on Mother’s Day. Those who love me understand. Those who don’t – well, I guess they don’t understand. Take a moment to say a prayer for the childless, particularly the ones who lost children in death and are left here to search for purpose and meaning in life.